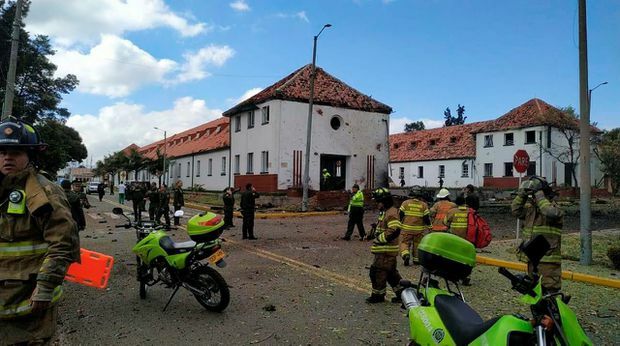 In this image provided by military personnel, emergency personnel respond to the scene of a deadly car bombing at a police academy on Jan. 17, 2019, in Bogota, Colombia. Colombian President Ivan Duque on Friday pressed Cuba to arrest 10 peace negotiators from the National Liberation Army after his government blamed the leftist group for a car bombing against a police academy that left 21 dead and dozens more wounded. Even though Jose Aldemar Rojas had no criminal record, authorities said that the 56-year-old man is the same individual who shows up in intelligence reports as alias Mocho Kiko and who is believed to have lost his arm manipulating explosives during a long clandestine career with an ELN cell near the border with Venezuela. He died in Thursday’s attack. Defence Minister Guillermo Botero said Rojas entered the heavily guarded facility via a side entrance used for deliveries, driving fast through a gate opened to allow the exit of a few motorcycles. He then drove into the heart of the school where the vehicle exploded in front of a red tile-roofed barrack used by female cadets just after an honour ceremony had concluded. “Colombia will demonstrate that it is a strong state, united and won’t break in the face of the dementia of these aggressions,” he said in a televised address Thursday night in which he declared three days of mourning. Police director Gen. Oscar Atehortua said just four of the deceased cadets have been fully identified because the bodies of many of the victims were badly mutilated. He asked family members to provide DNA samples to a team of forensic anthropologists trying to identify the dead from among a list of unaccounted-for cadets. The same volatile area is a stronghold of the ELN, which became the country’s last remaining rebel group following a 2016 accord between the government and the Revolutionary Armed Forces of Colombia that saw some 7,000 rebels disarm. Authorities said Rojas, as a member of the hardliner Domingo Lain front, travelled on several occasions to Venezuela to train rebels in the use of explosives. But until now the Cuban revolution-inspired group, which is believed to have around 1,500 fighters, has never been capable or much interested in carrying out such a high-profile act of violence. Duque in his address Friday stopped short of closing the door completely to a negotiated settlement to decades of warfare with the ELN. But he repeated his demand that the groups cease all attacks and kidnappings as a condition for restarting the talks. He also vowed to condemn any government that provides safe haven to the group – an indirect shot at Venezuela, where much of the ELN leadership is believed to be hiding out.